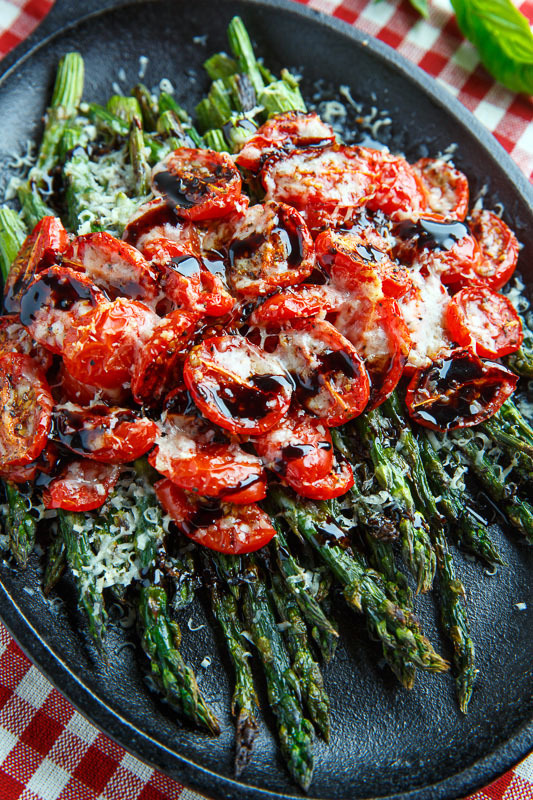 Roasted asparagus and tomatoes covered in melted parmesan and drizzled with a balsamic reduction. Up next is another asparagus dish and this time it’s roasted asparagus and tomatoes covered in melted parmesan cheese and drizzled with a balsamic reduction. Roasting the asparagus really brings out its flavour and the roasted tomatoes that are slightly caramelized on the outside and yet still bursting with juiciness on the inside go amazingly well together! The sweet and tart balsamic reduction brings everything home and complements the parmesan cheese perfectly! 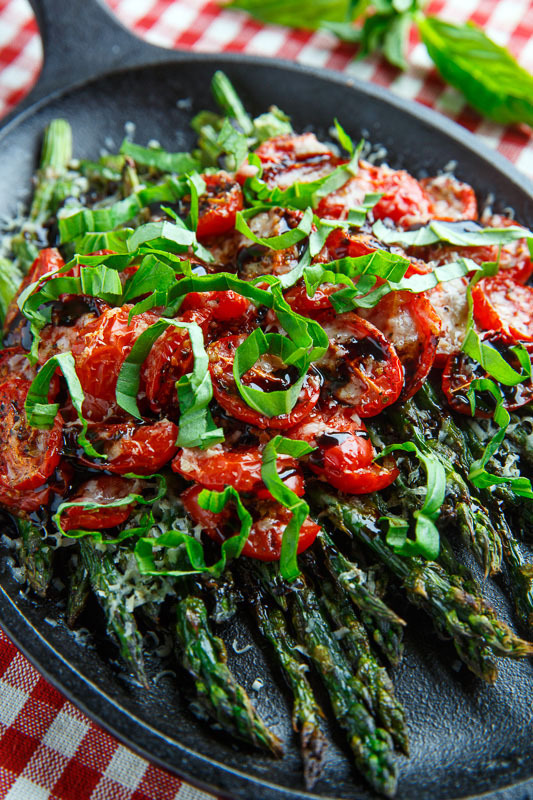 This parmesan roasted asparagus and tomatoes is so easy to make and it’s a fantastic side dish for any summer meal! Not that you will have any leftovers but if you were to make extra, the leftovers, when sliced up into bite sized pieces, make a great salad for lunch the next day served, cool, room temperature or reheated. Top with some some basil for a hit of summery freshness! 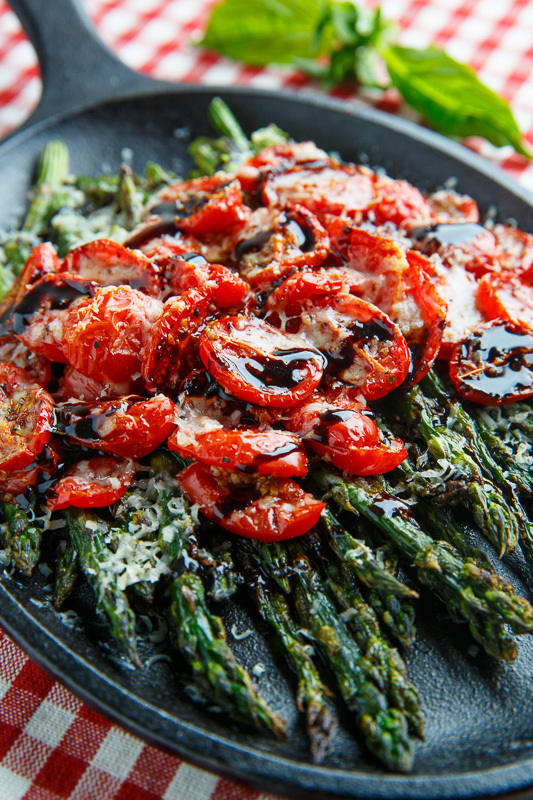 Toss the asparagus and tomatoes in the oil, salt and pepper, place on a baking sheet in a single layer, sprinkle on the parmesan and roast in a preheated 400F/200C oven until they start to caramelize, about 15-20 minutes, mixing half way through. Meanwhile, simmer the balsamic vinegar until it starts to thicken, about 10 minutes. 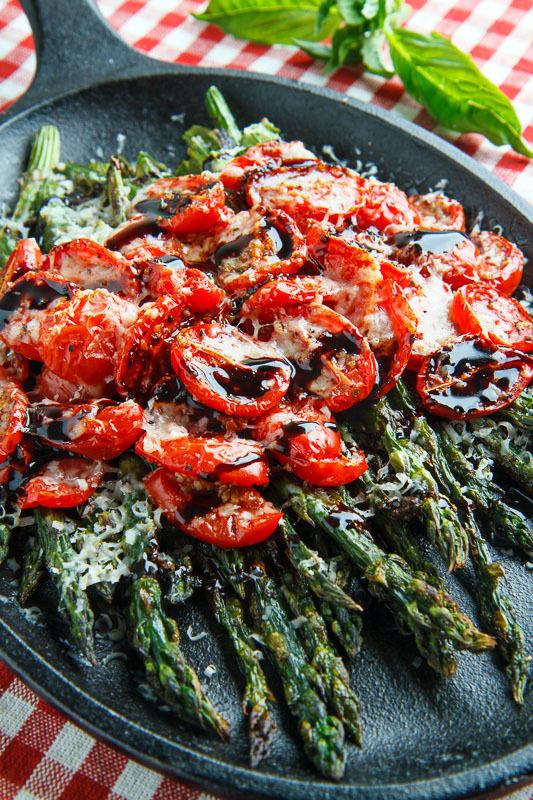 Serve the asparagus and tomatoes warm drizzled with the balsamic vinegar and garnished with the fresh basil. Total summer deliciousness right here! Love the simplicity. 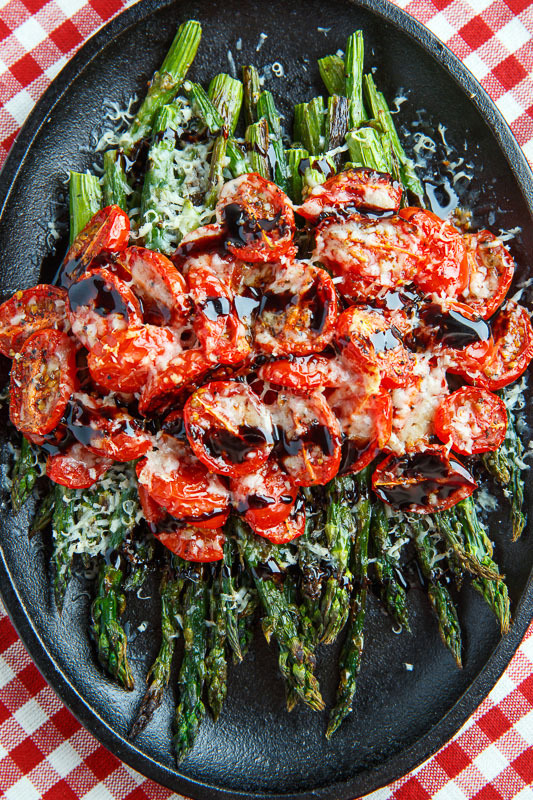 I love roasted asparagus and tomatoes and that balsamic glaze takes this dish to a whole new level! Love it all, Kevin! What a great dish both in colour and flavour! Now this is one gorgeous side dish. Love the simplicity of it!